To users of Mozilla Firefox it should be a familiar situation which Firefox development team starts an accelated development cycle and pushes new versions out in a shorter period of time. The new release cycle for new versions of Joomla! is 6-month, which means every half a year the Joomla! community will see a new version of Joomla! Just when we start to download and test Joomla! 1.7 Beta 1, the Joomla! 1.8 has already been scheduled to appear in January 2012. So, how are we going to keep up with all the new versions sproutting up every 6 months? Fortunately the new release cycle is also similar to the development cycle adopted by Ubuntu development team, which consists of two different releases, short term and long term. A short term release lasts only 6 months, but a long term release has one and a half years lifespan. Of course, both types of Joomla! releases will get updates when it's necessary. If your project requires stability, then you can choose to use a long term release of Joomla!. Otherwise, you can enjoy all the freshly new features with short term releases. Next question you might ask probably is how Joomla! maintains extension compatibility among versions? To answer that question, I must mention that Joomla! 1.7 is the first release separates Joomla! Platform and Joomla! CMS. Every 3 months a new version of Joomla! Platform is release. To people who have played with Plone CMS, you can identify the similarity of the relationship between Plone CMS and Zope. I imagine the Joomla! Development Team must stablize the platform and CMS API so that anything built on top of them can continue to be usable with this frenetic release cycle. What should you do if you are running your Web site with Joomla! 1.5.x? Probably nothing for now. Please note that Joomla! 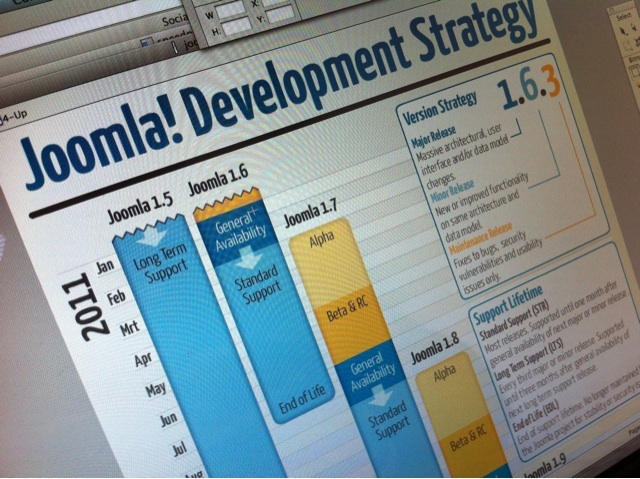 1.6 will reach the end of life in August 2011 when Joomla! 1.5 will continue to be supported until April 2012 after the next long term release, Joomla! 1.8, is out. Therefore there is no rush to upgrade your Web site right now, especially when required extensions are not upgraded yet. With that said, you should start planning and testing for the upgrade because upgrade from version 1.6.4 to version 1.7 will be easy but require a migration from version 1.5 using the jUpgrade component.